After enduring LA rush hour traffic and abandoning our original dinner plans, we were left with a bit of extra time to kill. Since we were heading back to our hotel in El Segundo, it wasn't too much of a detour to make our way to an iconic LA landmark. 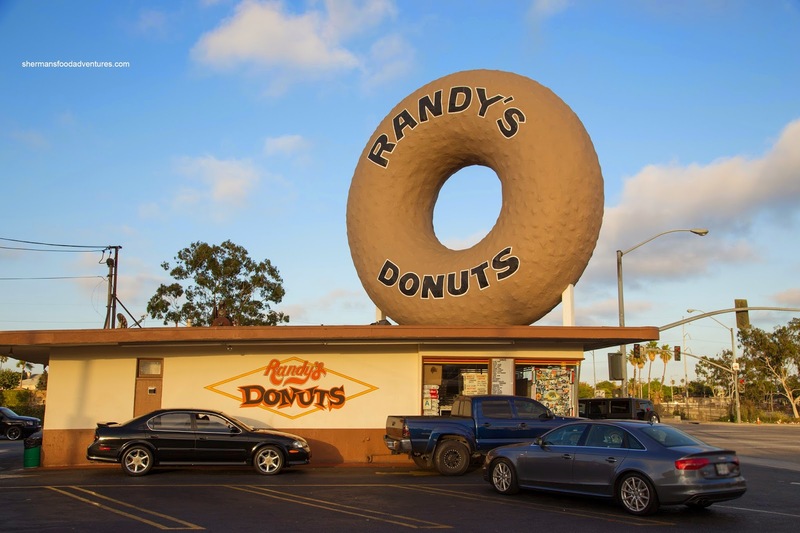 Yes, we're talking about that big donut at the corner of W. Manchester and S. La Sienega. Scratch another off my bucket list as we finally got to visit Randy's Donuts. And to head off the haters at the pass, I realize these are not the greatest donuts on Earth... But the novelty of it all, well, I couldn't resist. With a lineup at the front and the drive-thru, we weren't the only ones with a donut wish. 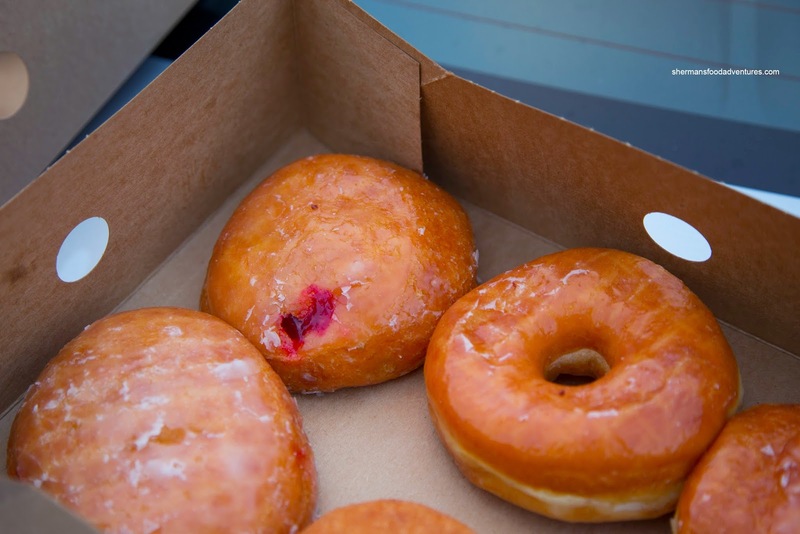 We sampled the Jelly Glazed Donut first and there was a tonne of strawberry filling. So much so, it couldn't stop squirting out. It wasn't too sweet though which was a good thing due to the glaze on the outside. The donut itself was not overly heavy. 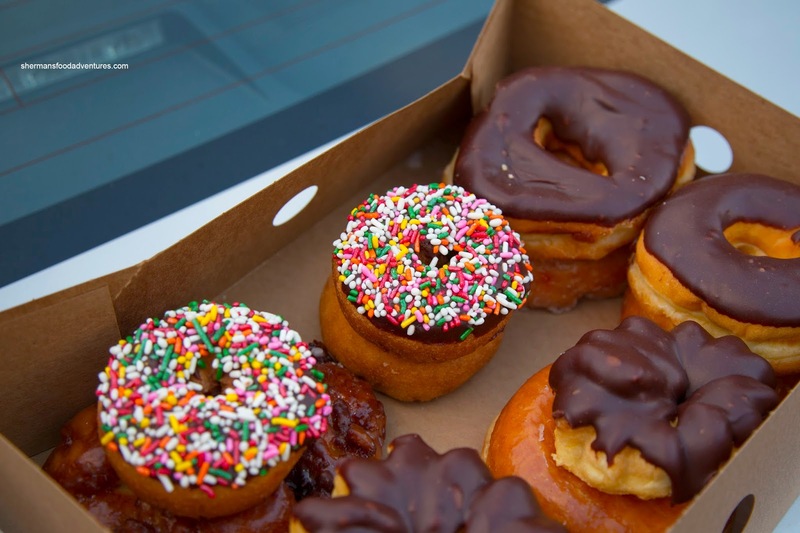 As for the cake donuts, in particular, the Sprinkle Chocolate Glaze, it was a bit dry and dense. The glaze was pretty sweet and with the sprinkles, it further amped the sugar quotient. In this case, less was more as the more basic donuts worked better. 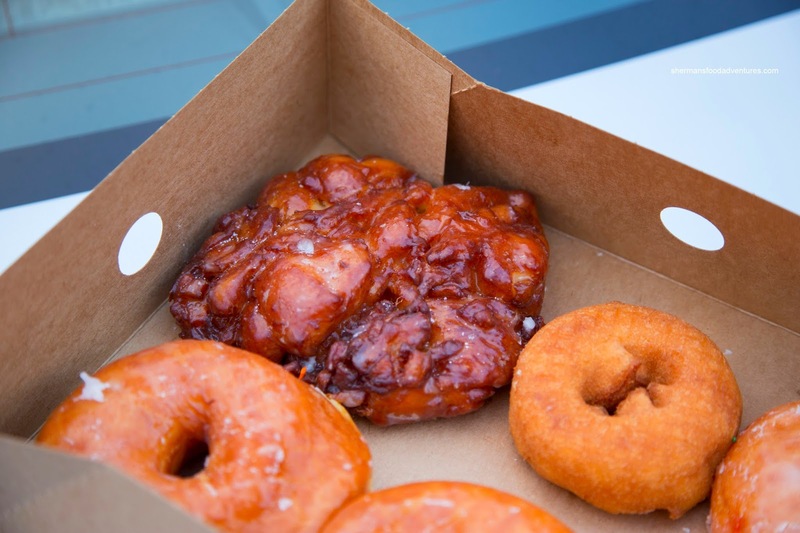 Moving onto the Apple Fritter, it was huge and very sweet due to the ample amount of glaze that nestled within all the nooks and crannies. There was a smattering of apple here in there within the firm donut. Interestingly, the Chocolate Crueler was not as sweet as it looked. Naturally, it was eggy and lighter than the other cake donuts. Overall, we didn't mind the donuts, especially for the price. Sure, they ain't gourmet and ultimately weren't super special, but it was cool to try them at least. - Look at that big donut on the roof!